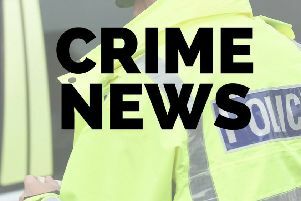 A stash of stolen property was found inside a wheelie bin after police were called to an incident at a house in Spilsby, Lincoln Crown Court was told. Officers receive visited the property in the town after receiving a call about an unconnected matter. Chris Jeyes, prosecuting, said that a holdall containing items including a jewellery box and watches was found inside the wheelie bin. The property was among items that had been stolen two months earlier during a burglary carried out at a farmhouse in Spilsby Road, Partney. Forensic tests linked Martin Fox to the stolen property with his DNA being found on some of the items. Mr Jeyes said that Fox was arrested and interviewed only to deny any knowledge of the items. But in court on Friday Fox, 44, of Old Market Avenue, Spilsby, admitted a charge of handling stolen goods between February 14 and April 20 this year. He was jailed for four months. The court heard that Fox had 44 previous convictions for a total of 124 offences. Neil Sands, in mitigation, said that Fox’s reputation meant that would be offered stolen property by burglars. He said that Fox had submitted a basis of plea that the items were brought to him in March by another man who asked if he was interested in buying them. The property was left with him and the man did not return.